While disposable coffee filters are relatively inexpensive you can save some money over the long run buy investing a in a reusable gold coffee filter. In my price comparison you can get the cheapest coffee filters for right around 1-3¢ each at stores such as Walmart & Kmart. And that is not a huge investment. Of course there are more expensive types of coffee filters too. But for right around $4.00 at those same stores you can purchase a gold reusable coffee filter which will last for years and years (I am going on year 7 on the one I currently use). So over the course of time you do end up saving money. The bonus however, is that your coffee will taste much better. Why is that? Because the oils in the coffee are what carry the flavor and many of those oils are absorbed by the paper coffee filters and you don’t get the full flavor of your coffee in your cup. However, with a gold reusable coffee filter all of the flavorful coffee oils are passed into the pot and are not absorbed. I swear I can taste the difference when coffee is made in a paper filter vs. a gold filter. Like I mentioned above you can purchase the gold reusable coffee filters at most stores such as Walmart, Kmart, Target and even your local grocery stores. They are pretty easy to find. What do you think? 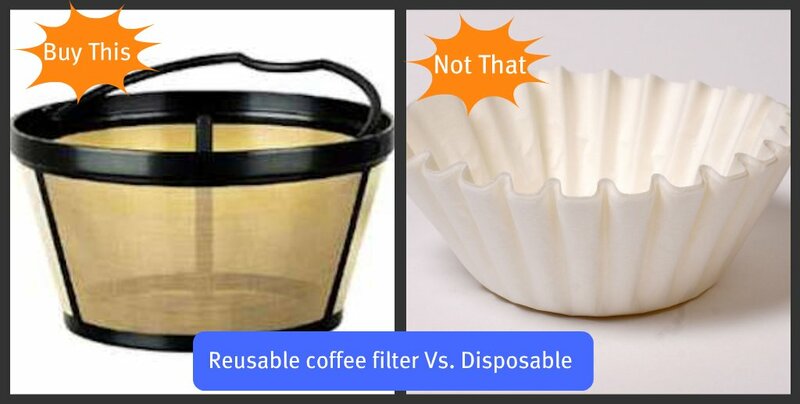 Is it worth investing in a reusable coffee filter? Leave a comment below and let us know! I’m totally buying one of these!!! I have one and I get more sludge in the bottom of the cup. Lauria – Interesting. I don’t seem to have that problem. How do you clean this kind of filter? Cathy – I just dump the used coffee grounds in my compost bucket and give it quick rinse in the sink. I just tried this coffee filter and it is true, the coffee tastes way better. I am loving this plus no more worries of running to get paper filters. Hi Marion, thanks for dropping by and letting us know your thoughts on using the reusable coffee filter. I think coffee tastes way better this way too!